J44 - Hearts! Hearts! You can't help but fall in love with these hearts. 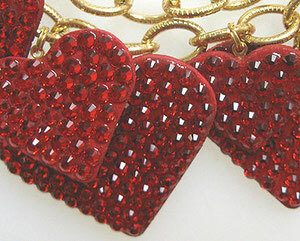 This necklace is a simply irresistible. We used a variety of small and large hearts. and covered them with Lt. Siam Red, Swarovski crystals. 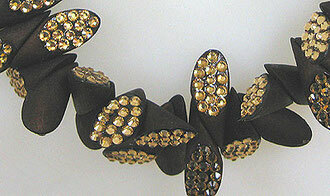 We attached them to a bold gold chain and layered them so that they fall perfectly together. 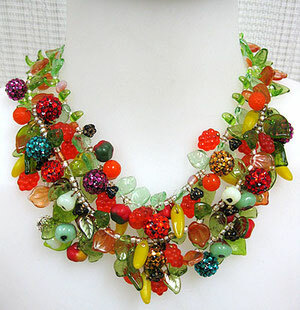 J66 - Carmen Miranda - This playful colorful three strand necklace is filled with a variety of glass fruits and varying hues of glass leaves. 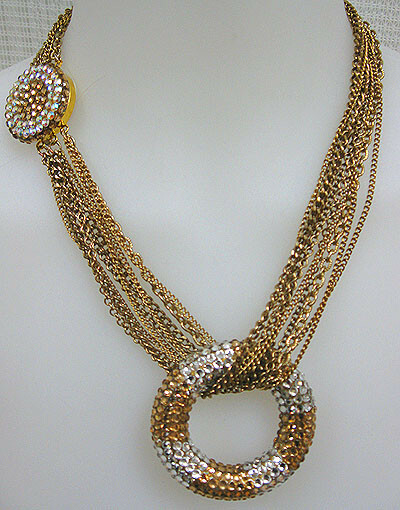 You know we just could not say it was perfect until we added some Swarovki crystal pave balls. They really make this piece pop. Wear this one for a special summer evening out. 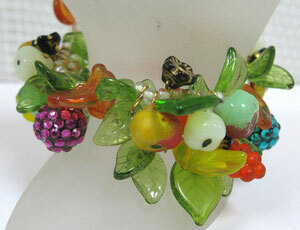 J67 - Carmen Miranda Bracelet, This is the matching bracelet to the necklace above. We used the same fruits and leaves..gotta have it! 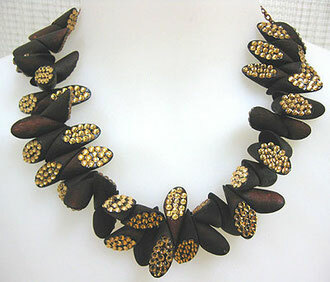 J43 - We truely love the way these dark natural wood wedges hug each other to form a really unique necklace. We couldn't leave it as is so we added some Light Colorado Topaz Swarovski crystal to the flat ends. A true mix of yen and yang. 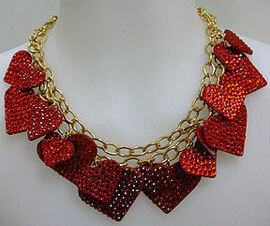 This necklace is for the lady who wants to be noticed. It is over the top and will definitely get you the compliments. you want. 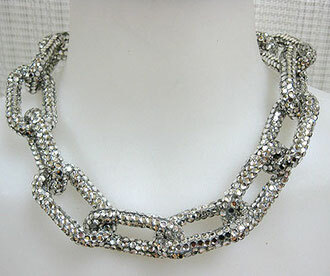 We paved this chain in clear crystals. 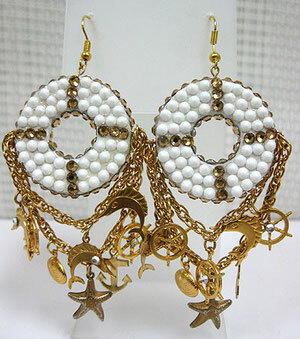 J26 - Earrings to wear for a summer evening out. We took sea charms and added them to a Chalkwhite and Light Colorado Topaz donut shape. 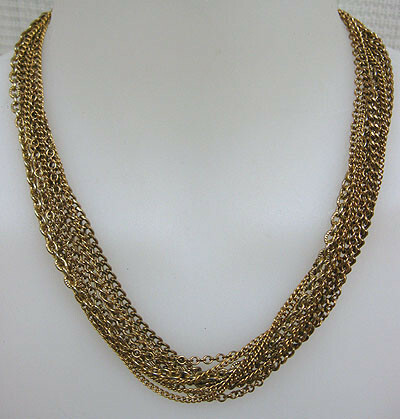 Gold charms and chain make these very casual, yet elegant. 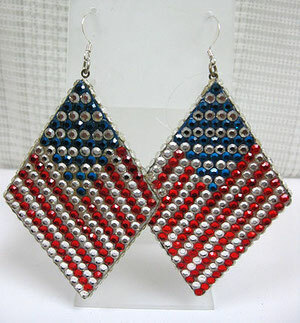 J58 - American Flag Earrings, Wear these earrings to show how patriotic you are. We used capri blue and clear Swarovski crystals for the stars...the strips were created with light siam red and clear crystals. 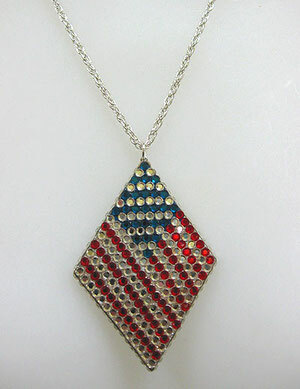 We've even created a matching necklace...see below. 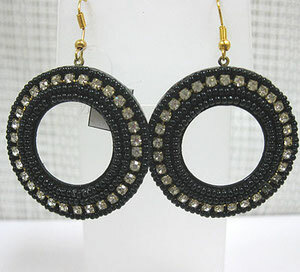 J100 - These elegant flat ring earrings are surrounded with jet seedbeads. We put crystal in the center and we think they made these earrrings oh so beautiful. J101 - This show piece is unusual. Instead of stringing it the usual way we thought we would give it a completely different spin and we love the way it came out. 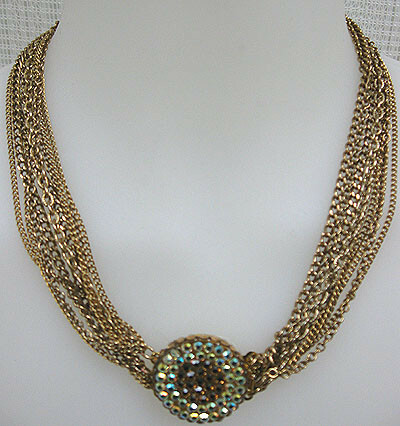 We paved clear crystals on the three art deco looking pieces and added more bling in the center. This one is totally self adjustable so one size will fit all. 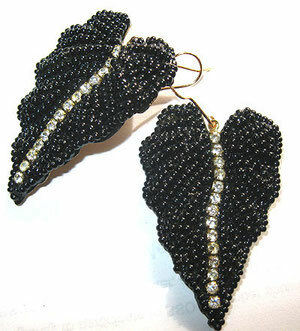 J102 - Simply Noir - We worked up these leaves with jet seedbeads and clear crystals straight down the center. These are sophisticated and stylish. The brass base we used has an organic natural shape and is so three dimensional. 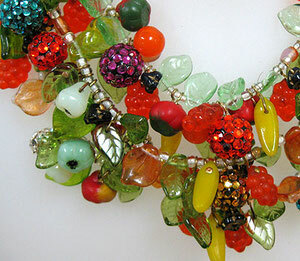 J103 - This vintage necklace is filled with vintage beads from the 50's and 60's. 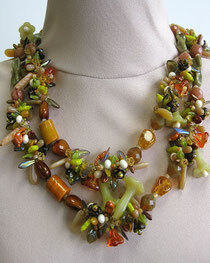 We mixed autumn colors and swirled clusters of flower and pod beads to create this 36" long necklace. 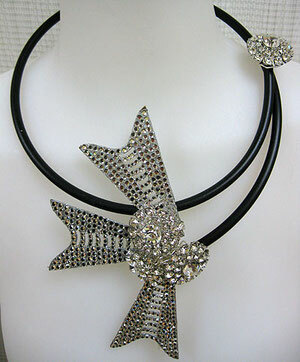 It can be worn double or single. 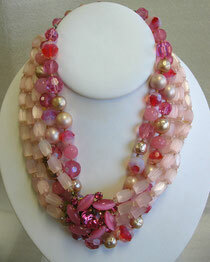 J104 - Pretty in Pink..The Satin glass light pink vintage beads twist around this necklace. The center clasp can be worn in the center, on the side or in the back...but who would wear such a beautiful focal piece on the back of their neck.Swarovski crystal beads adorn the center stone on the clasp.